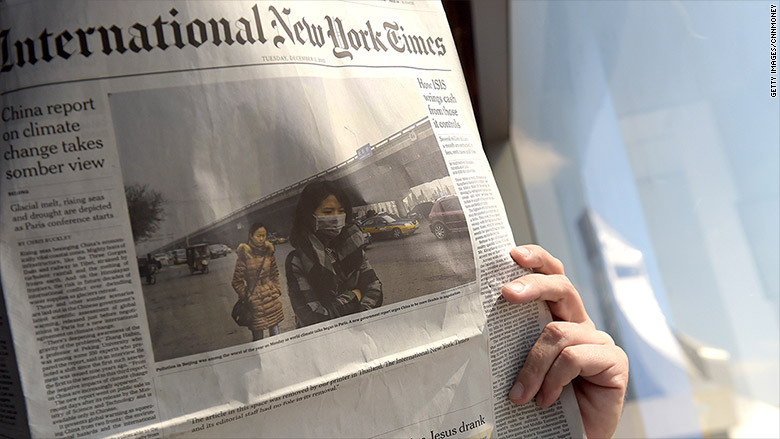 The New York Times was published in Thailand with a front page story missing because a printer refused to publish it. The printer that publishes the New York Times' international edition in Thailand refused to run a front-page article about the country's sagging economy, leaving a portion of the newspaper blank in that country. The story, which declared that "Thailand is in a rut," highlighted skyrocketing levels of household debt, rising crime and increased military control of the government. But in Thailand, the text that ran on the front page read, "The article in this space was removed by our printer in Thailand. The International New York Times and its editorial staff had no role in its removal." Eileen Murphy, the Times' chief spokesperson, said the company had been notified of the printer's decision and that the Times had no role in it. "We understand the pressures local publishers sometimes face," she said, "but we regret any censorship of our journalism." Thailand has significantly restricted press freedoms since 2014 when the Royal Thai Army staged a military coup and took control of the government. The same Thai printer refused to print an entire edition of the paper in September because the edition contained a story about the King of Thailand's declining health, which it deemed too sensitive to print.